Born and educated in Paris, Grégoire moved to Belgium a long time ago, where he graduated in architecture at La Cambre, Brussels. Working in partnership with friends came naturally for years until he co-founded DDS+ in 2006. 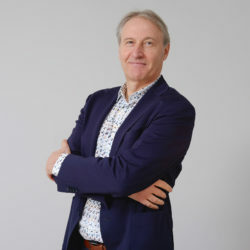 After trying his hand in the whole field of the architect’s mission, from the initial contacts with clients, via supervising project teams up to the stage of building handover, he now focuses on supporting DDS+ clients in preliminary feasibility studies and in the early phases of project development. Besides loving music, food and wine, he handles the DDS+ finance, administrative and legal team, where he can practise his legendary diplomacy every day.